T.S. Eliot once said "April is the cruellest month of the year." I am today adding to his words, "and so was September 2012!" Preparing for Roshanna can be an ordeal. Who will lead the prayers? Will Rabbi Mark al-Fassi agree to come from Paris? Will the JOINT be kind enough to pay for his travel expenses? And now that Sinai is OUT, will the special food the JOINT sends for Roshanna arrive by air? If so will it be delivered on time? Will the invited ambassadors attend? Who among the diplomats, students and friends will accept to join us in our celebration? All this multiplied tenfold this ROSHANNA 16th of September 2012. A date to remember! THE RABBI. The JOINT kindly agrees to pay for the rabbi. Mark al-Fassi, against all odds, accepts to come despite the evil media publicity claiming that the �Alexandria Synagogue Eliahu Hannabi has been closed and taken over by the government." And that "prayers therein are forbidden!" All of this BALAGAN, as our friend Ami is wont to say, frightened Mark al-Fassi's friends who urged him not to come. Neither did four days of rioting around the American embassy help! I must admit it was near heroic of him to keep his word and show up. THE FOOD. The Israeli Ambassador was kind enough to accept supervising the receiving of the food, clearing it through customs, getting out all necessary documents, plus delivering it at the JCC door. Likewise, he made sure the Alexandria community got its fair share and, contrary to media claims, they DID celebrate in spite of Abraham Dayan and his acolytes. So the food is distributed and everything so far is fine. So far. 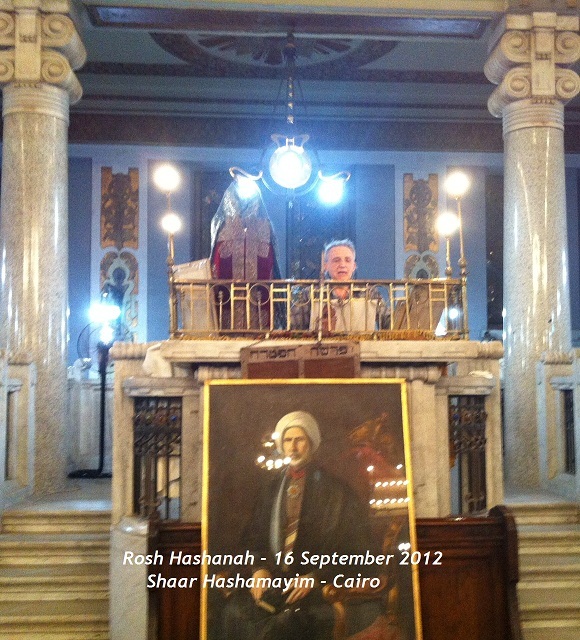 THE CELEBRATION: We eventually decided to celebrate Roshanna at the landmark Shaar Hashamayim Synagogue in downtown Cairo. Usually this is a relief for our community members who find the trip to Maadi and back quite tiring. Hence, all is pre-settled with the security personnel both outside the Synagogue and within. BUT then... all Hell is let loose. The anti- Islamic film riots start and we change almost twice a day the location of the celebration at the request of diplomatic friends. Will it be Maadi or will it be downtown? I even thought of Ben Ezra. Finally, appeasement falls on Midan Tahrir and arguably the final choice is Shaar Hashamayim. HIGH ANXIETY. People are calling all the time. They either want to find out the venue or whether or not the celebration is going to take place, or both. Even on the day itself I was getting inquiries and requests to attend. Truthfully, I thought we would be a mere twenty. We ended 'MASHA'ALLAH' MORE THAN 60.  17:30 SUNDAY, 16 SEPTEMBER 2012. Guests start to arrive for the celebration of our New Year. By 18:15 almost everybody made it: community members, year-abroad students, Austrian Ambassador Tomas Nader and his lovely wife Ingrid, the new Austiran deputy chief of mission (DCM) Rene Paul and his American counterpart. In fact DCM Mark Sievers arrived accompanied by our friend Peter Shea and the new political secretary Mr Robert Stern plus several others from the American Embassy. Ambassador Ann Patterson and her husband, who usually share our celebrations, had just returned from holiday and thus couldn't make it. THE PRAYER. Mark al-Fassi starts praying but September, which is supposed to herald autumn with a cool and fragrant air, is stifling hot. Almost 37 celsius! 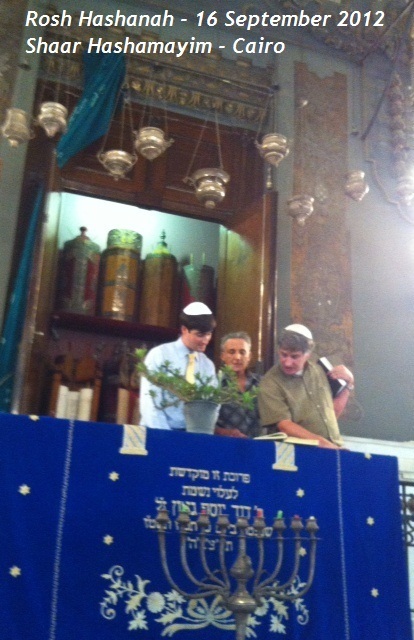 Nevertheless, our courageous Rabbi is praying stoically bearing the heat until an electric fan is wheeled into the Bima. Since the synagogue is listed as a principal Egyptian Jewish antiquity, we cannot install that miraculous device the Air-Condition. 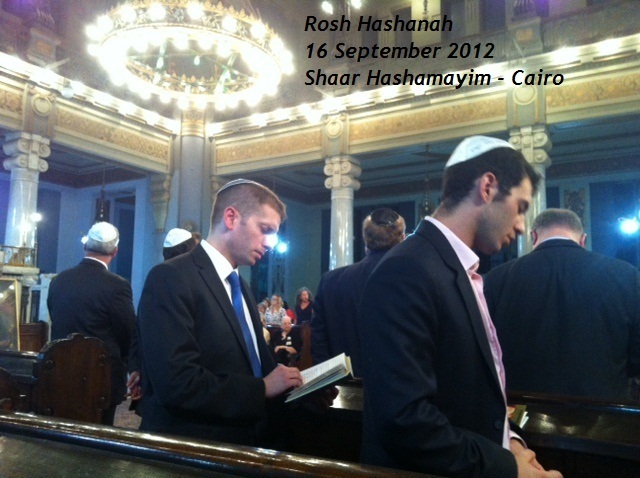 The prayer continues followed with devotions at the Ekhal with the Sefer Toras. The ceremony lasts for more than one hour. I quote here our webmaster Samir Raafat who thought the celebration not as brilliant as of days past. It is partially true. 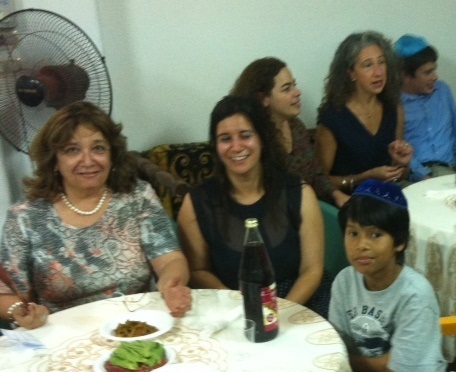 Back then we welcomed the full or partial attendance of the Israeli embassy members. Despite their understandable absence, we are doing our best. Moreover, present circumstances do not call for flamboyancy. To be noted that even those of us who are sick and/or need wheel chairs, canes or crutches are doing their best to keep on. Such is life and we accept it keeping on our traditions as best we can. THE DINNER. 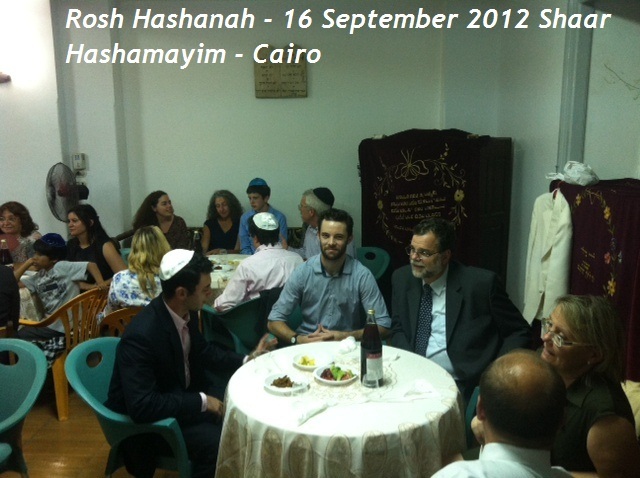 After prayers we moved to the ground floor Shaar Hashamayim function hall for the traditional dinner. Mark al-Fassi did the usual "BEROKHOT" over pomegranates, dates and apples dipped in honey etc. The buffet dinner was plentiful, but unfortunately, because of the unexpected heat, most of the food had to be disposed of. One does what one can. The important thing is that we put our hearts in our prayers and holy celebrations and keep going. The Synagogue is open for the first day of Roshanna. Miraculously we have a minyan, which rarely happened in previous years. Mark al-Fassi conducted prayers that ended with the traditional five-time blowing of the SHOFAR echoing the past when it was used to call worshipers to come and pray. The last call ends the prayers for roshanna Day One (1 Tishrei 5773). More prayers on the 2nd day of Roshanna. And another five blasts of the shofar the last one signaling the end of Roshanna prayers Day Two. It seems when things are looking not so good, people turn more to faith. And now, as we embark on a new year the JCC thanks all our friends who joined our celebrations and together we applaud Rabbi Rabbi Mark al-Fassi who braved everyone to come and conduct our prayers. Lastly, a thank you to our good friend Samir for keeping us on the net. Bravo to all and Happy Holidays! 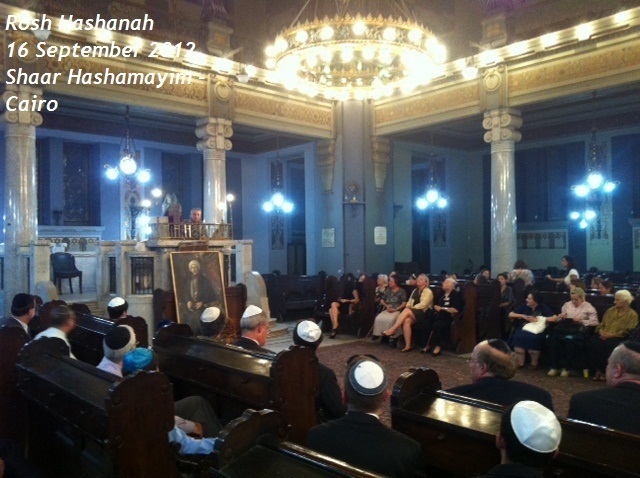 It is with much emotion that I read about the Rosh Hashanah Services bring conducted at the Great Synagogue "Chaar Hachamain". The last time I attended those services was in 1953 when I came back to Cairo after my graduation from a Grande Ecole in Paris, France. I look at the pictures taken inside the Synagogue with tears in my eyes, as I locate the seats where my father and I used to sit each Shabbat and during the High Holidays. I remember also my grand-uncle, Moshe Lagnado, exercising the Gabbai religious duties. That was a long time ago; but the memories live on. I came to visit the family before starting my career at the Research Laboratories of the Philips Electronics Co. in Eindhoven, Holland. It was fortunate that I was out of Egypt in 1956 when the 5-day war started and the Second Exodus accelerated. I was able, with the help of my employer, to get all seven members of my immediate family out of Egypt to join me in Holland. From there we made our way to the United States in 1958, where our children and grandchildren enjoy listening about, and learning from, a long-past era. Your work on behalf of the Jewish Community is admired internationally. Chapeau; I tip my hat. It is my wish that Hachem Grant you the strength, good health, peace of mind, serenity and sanctity for many years to come to enable you performing these acts of love toward your fellow-Jews. You are truly blessed. 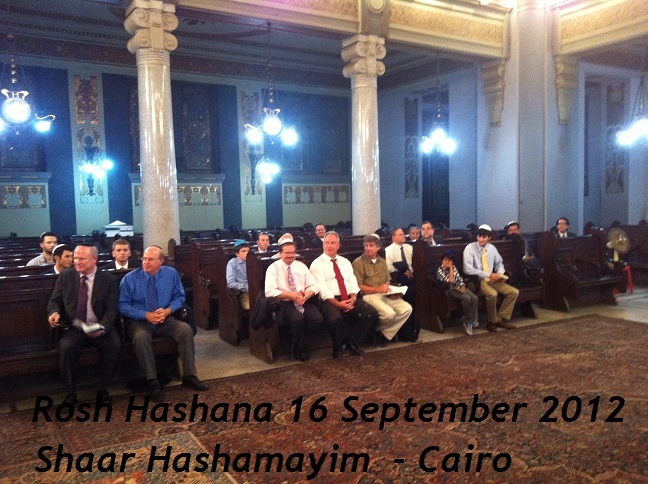 It was a real honour to celebrate Rosh Hashanah with the Cairo Jewish community last night at Adly St synagogue last night. Thank you so much for your gracious hospitality. I should also mention that I have greatly enjoyed reading over past issues of Bassatine news, finding it a fascinating resource for researching Judaism in Cairo. Well I was terribly moved by your account of Rosh Hashanah prayers at Adly Street this year that Rabbi Baker was kind enough to pass along to me tonite. You gave a marvellous description of what took place and it made me long to be there and so -- Perhaps I shall see you, God willing, later in the fall; i want very much to see the synagogues again. Congratulations for pulling it off once again. 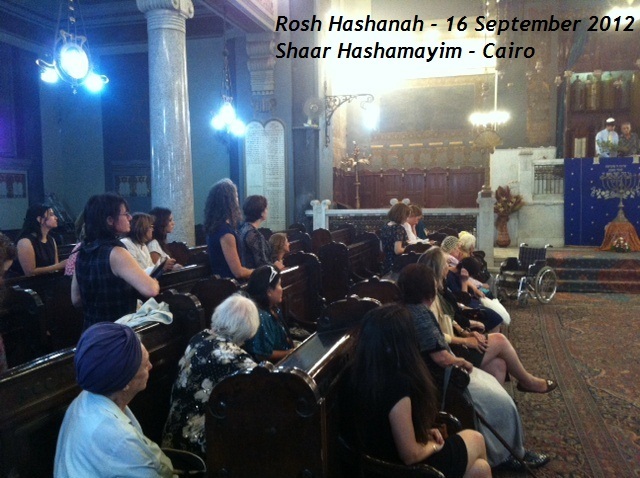 Nous avons �t� enchant�s et �mus de voir le dernier num�ro de Bassatine News consacr� � la c�l�bration de la f�te de Roch Hachana. Chana Tova � toi, aux tiens, � ta communaut� et encore un grand bravo! 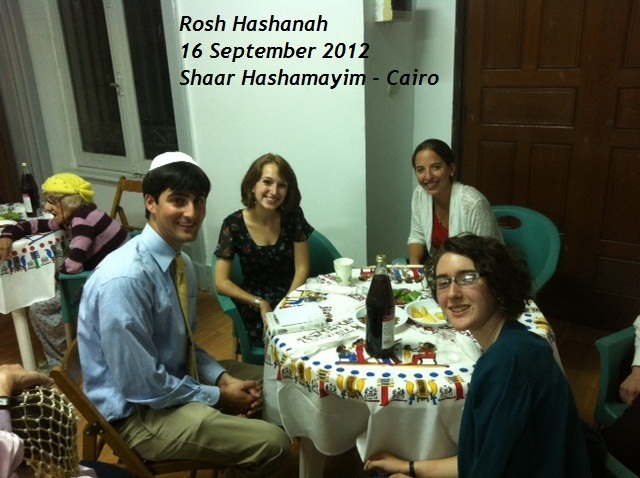 Je suis extr�mement touch� d'avoir pu participer par la pens�e � vos c�l�brations de Rosh Hashana. Je vous suis tr�s reconnaissant de m'avoir envoy� ces belles photos de notre ami Samir. Je pense souvent � vous et � ma jeunesse au Caire et � M�adi, et une partie de mon coeur est rest�e � jamais l�-bas, parmi les flamboyants et les buissons de lantana et de jasmin. Que c'est loin et pourtant si proche ! Je vous embrasse, m�me si vous ne vous souvenez pas de moi. I was touched by the pictures, thank you! My name is Nona Orbach, I am artist from Israel. Shana Tova. Many thanks for including me in the wonderful services this week. 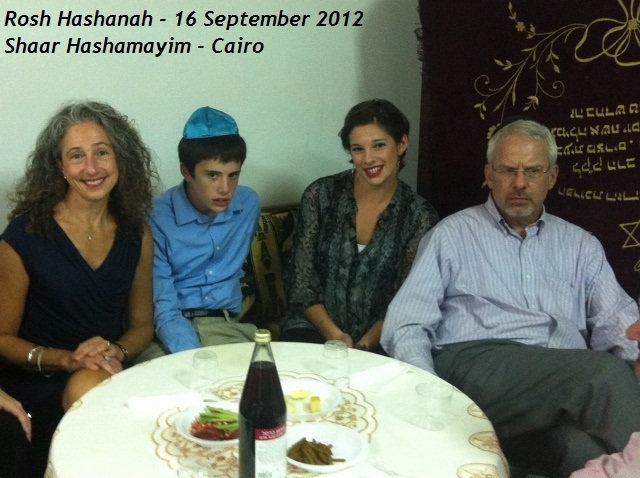 And thank you for this insightful and beautiful website with photos of Rosh Hashana. Tres interessant Chere Madame Weinstein...toujours heureux de vous lire... bisous...partout! 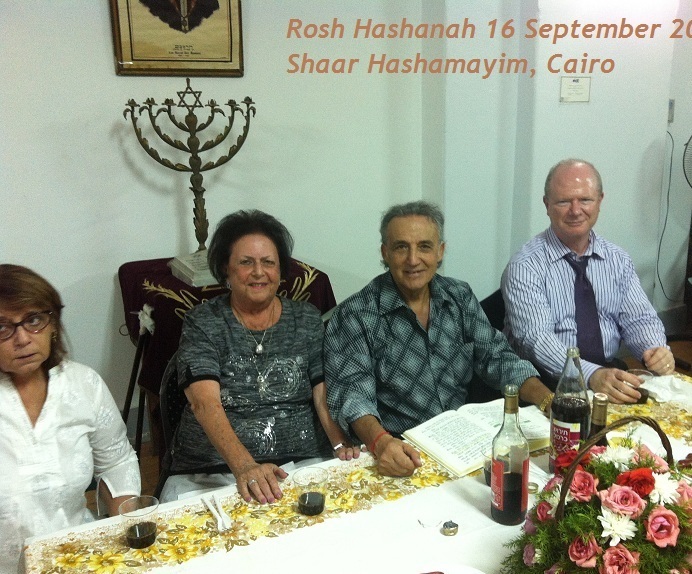 Thank you so much for sending the good news that Rosh Hashanah services were conducted at Adly St Synagogue.I had been most upset to hear the news of services having been forbidden in Egypt this year. Your most welcome email has shown me not to always trust what I read on the internet. You have my admiration in all that you do and I remember fondly our meeting back in October 2009. I wish you and the community a Shana Tovah, a safe, healthy & happy New Year. Shana tovah! Kull sanah wa-inti tayyibah! Thank you for sending this. I had been meaning to write to you following your clarification of what was happening in Alex. I actually forwarded it to a friend of mine who works at CNN as they had been spreading the information that the Alex synagogue was closed. I also don't know where ynews got the idea that the Alex synagogue was the only functioning synagogue in Egypt. Anyway, i wish you continued good health and strength to continue in the good work that you do. 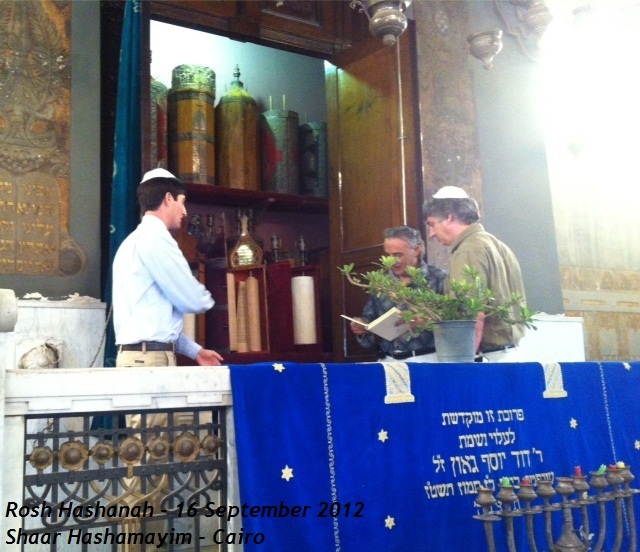 Thank you for all you to do maintain and preserve the Jewish legacy in Egypt! Congratulations. Once again you have done a fantastic job. May the new year bring you and your community health and happiness! Shana Tova!!!! I'm sending you all my love on this special occasion. You are a beacon in everyone's eyes and you alone have kept the fire burning on the banks of the Nile. I miss you and hope to see you soon. Wonderful to see what you have achieved in the face if so many difficulties. May this year be healthy and peaceful for you and all those you hold dear.